The event took place last Wednesday and was a great opportunity to meet people. I met George Pollard, the new Sustrans officer at the University. And then he equipped half-a-dozen students with bikes from his Sustrans “fleet”. Two more helpers turned up: John from the CTC and Bill, George’s brother, of Bomberdrome and Ministry of Bicycles fame. We made a little alternative to the planned route down to the Brampton Valley Way – going through Obelisk Spinney into Boughton rather than down Lynton Avenue to the A508. 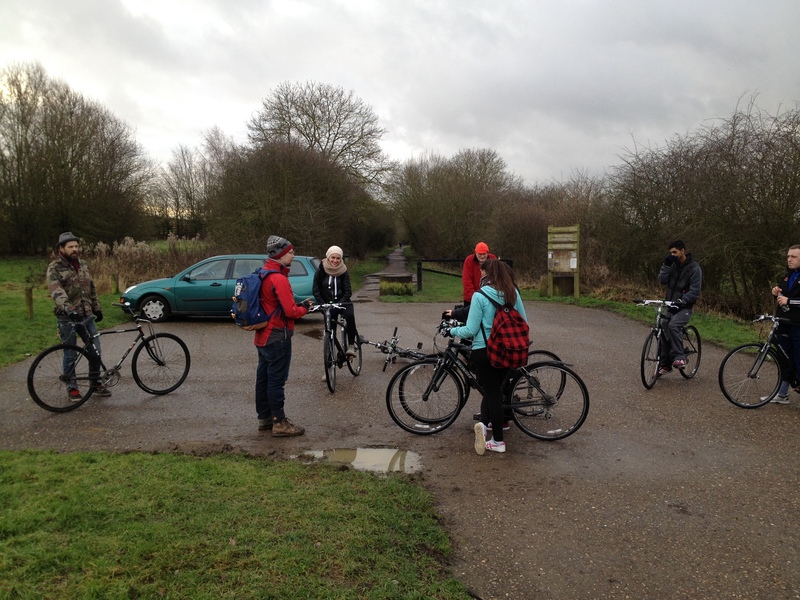 The students were keen on the fast descent of Brampton Lane and enjoyed the flat BVW going further than they thought. With of course the result that there was further to pedal back! A non-alcoholic break was taken at The Windhover, hosted by George (Sustrans’ expenses exclude the taking of alcoholic beverages. Then we were off along the BVW towards Kingsthorpe, leaving at Kentstone Avenue before a slightly gentler climb up to the University. And one little alternative again: straight along Reynard Way to use the toucan crossing of Holly Lodge Drive. The students all enjoyed it. The prize for those who had come the furthest went to the three Greek students on Erasmus exchanges! Route here: http://ridewithgps.com/trips/2183486 and the Greek girls were very pleased to have cycled 20 kilometres! 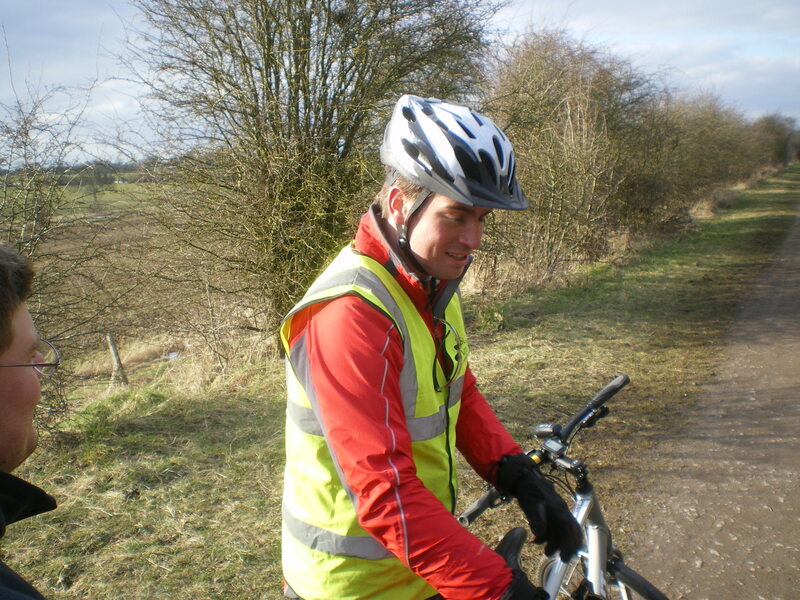 This afternoon I went along to my local university (the main campus of the University of Northampton is less than five minutes away) at the invitation of Dan Romberg who is Sustrans’ university officer there. With a colleague who works in local schools, he has a project to reduce congestion in the “Kingsthorpe corridor”. 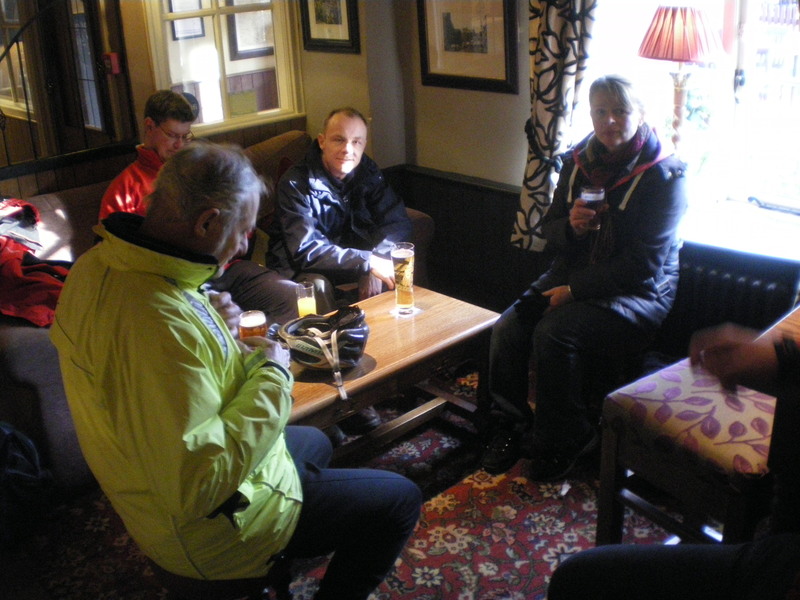 With two other CTC friends – John and Phil L – I was to help him lead a group ride out to, and then along, the Brampton Valley Way. 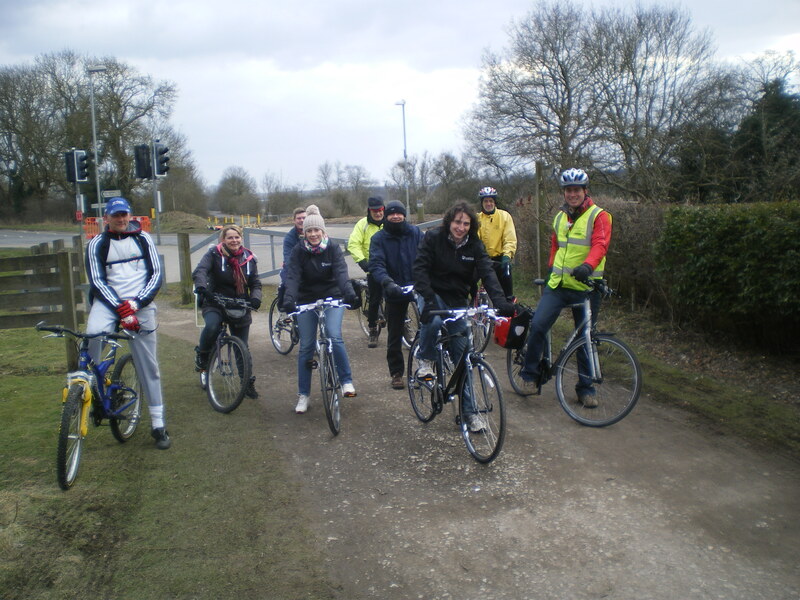 The individuals who made up the group were staff members from the university, most of whom lived locally and might be helped to make a decision to cycle to work rather than always travelling by car. It was a great afternoon! Sustrans has found the money for half-a-dozen new hybrid bikes. (By coincidence from Pitsford Cycles where my touring bike is presently being serviced.) We collected them from a secure bike park and this was to be their first outing. Dan had checked them in advance and my job was to adjust the saddle height for the riders who chose them. When the ride started, I was Tail-End Charlie. We went out through the quiet roads of two or three housing estates (including the one where I live) with just a short stretch of 300 metres along the A508 before turning onto a great downhill down Brampton Lane. Hats went flying! We re-grouped at the start of the Brampton Valley Way. and then there was no stopping anyone! One or two stretches of the path, where it was exposed, were bitterly cold but in the sheltered parts (which form the majority) it was lovely and … sunny! We passed the restored Pitsford railway and the Merry Tom crossing and almost reached the Brixworth-to-Spratton road – before someone remembered that a pub stop had been promised! We turned about and pedalled to an old favourite, “The Windhover”. The first puncture (someone had been flailing hedges and there were thorns aplenty) happened just before the pub. The rider manfully carried on until it could be repaired indoors! Dan was a whizz at repairing the puncture inside the pub. I don’t think I’ve seen that before. And then, finding a quiet way back to the university, our second puncture happened just having left the pub. Dan was even faster at getting that one repaired. John had chosen a route that didn’t take in too much hill climbing although, because we’d all enjoyed the chatter in the pub, dusk was upon us. The Sustrans bikes had lights and so all was well. 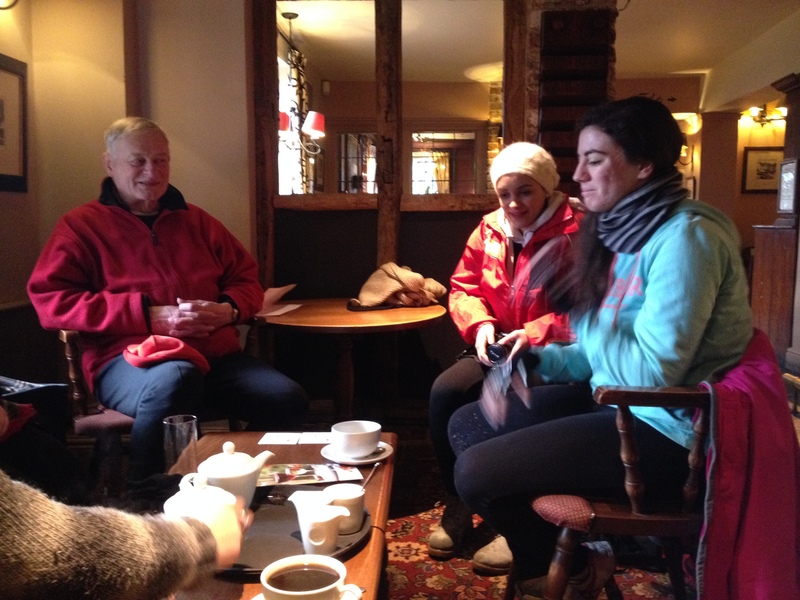 Everyone had enjoyed themselves, agreed that the exercise had been good fun, and some were enquiring about other organised rides – and indeed the possibility of cycling to work once or twice a week! Part of the route – from the University to The Windhover is here.